January 31st, 2017 – Middelharnis, The Netherlands – OPNsense is the fastest growing open source firewall and security platform released under an Open Source Initiative approved license. The project combines the best of open source and proprietary firewalls. It offers a rich feature set, the benefits of open and verifiable sources and can be downloaded for free. 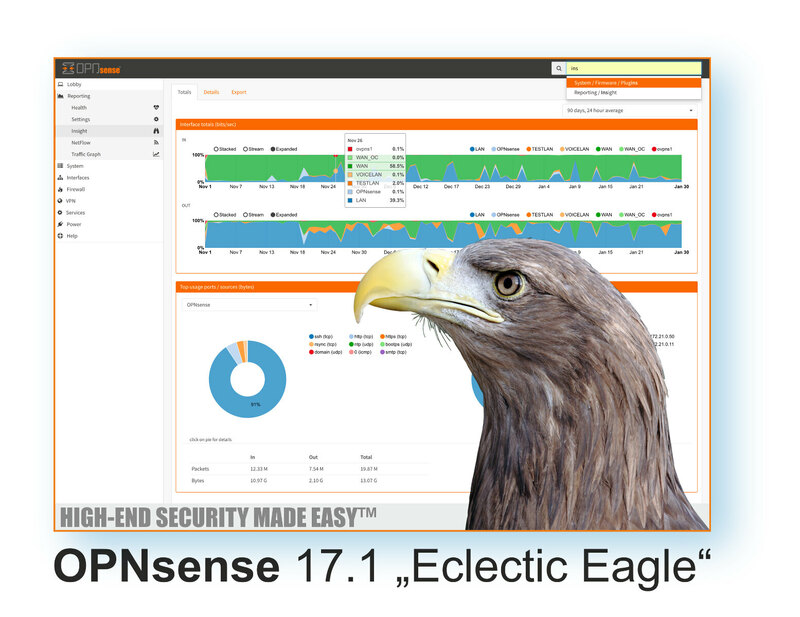 Deciso is proud to announce the immediate availability of version 17.1 named “Eclectic Eagle”. Since the previous major release, its impressive feature set has been expanded with full mesh routing for virtual private networks, enhanced multi-WAN support, native PAM authentication against e.g. 2 Factor Authentication (TOTP) and various new or updated plugins. The community has grown significantly and a new core team member has joined our efforts to become the most widely used open source security platform available. The user experience has been further improved by adding remote installation support using SSH, new flash images that adapt automatically to the disk size as well as many GUI enhancements and 4 new languages bringing the total supported languages to 10. For developers, the RESTful API and the pluggable infrastructure has been further extended to include pluggable firewall rules & authentication services. At the same time unit test where added for main parts of the MVC framework. OPNsense 17.1 is the first open source firewall to feature FreeBSD 11 at its core for long-term support and the only one to offer state-of-the-art HardenedBSD security features. For the latest release the reliable and secure update mechanism was extended to offer full change logs as well as a new audit feature that is able to check the installed version for known security issues. Deciso is the company that founded the OPNsense project and offers turnkey solutions as well as commercial support and services.